The summer fishing season is upon us and with it comes the crowds. This especially is true on weekends and holidays. 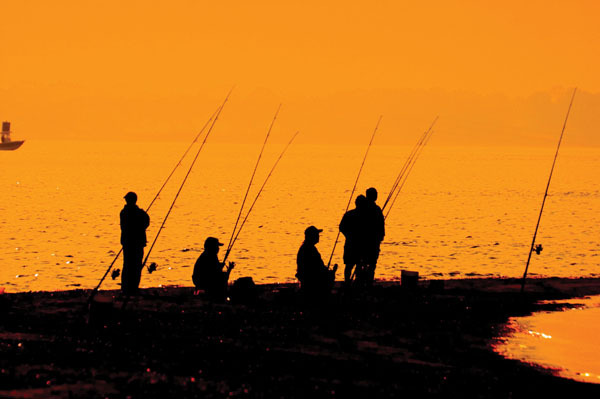 Too often an outing is ruined by an exchange of pleasantries between anglers in both boats and on shore. Although no one likes fishing in a crowd, having company on the water is just a fact of fishing life. However, there are steps every angler should take to make sure everyone has a safe, productive and enjoyable day on the water. Whether you’re fishing a lake, bay or river, basic angling etiquette is the best way to avoid problems and ensure a pleasant outing. Angling etiquette is especially important in walk-up locales. 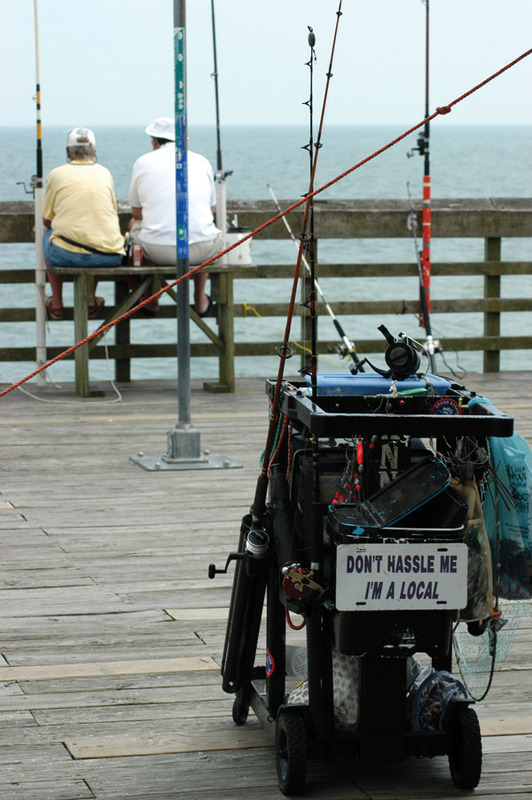 Whether it’s a fishing pier, rock jetty or beachfront wade-fishing, those who arrive on foot have limited mobility and are restricted by the physical size of the place where they are fishing. Therefore, following proper protocol is crucial for all anglers. Rule No. 1 for any walk-up location is to give other anglers plenty of room, at least enough space to be able to comfortably cast. Granted, at times this isn’t possible, especially on crowded piers and jetties. However, if there is space available, it’s best to spread out and not crowd your fellow fishermen. Another key to maintaining the peace at walk-up locations is to pay attention to wind and current and how others are fishing. For example, if everyone to either side of you is fishing a bottom rig, don’t try drifting with a float or bobber. Doing so will ensure tangled lines. Furthermore, before casting — whether fishing lures, float rigs or bottom rigs — look to see which way the current or wind is moving other anglers’ lines. Try to work in lockstep with those around you to avoid crossing lines. Although this sounds simple, following this basic rule can prevent massive line tangles and flaring tempers. Finally, don’t be afraid to share. This isn’t to say you need to provide a communal tackle box, but if a fellow fisherman runs out of something such as hooks or weights and you’re in a position to lend a few, do so. Saving an angler from having to walk back to the car or end a trip early will be much appreciated, and your kindness will usually be repaid. 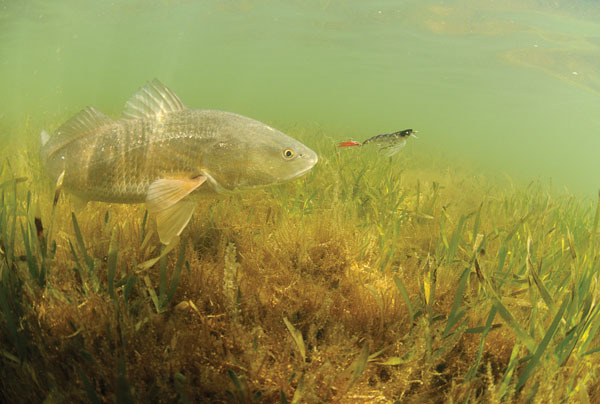 A boat angler tempts a hungry redfish with a Yo-Zuri 3d Crystal Shrimp. Boaters have the ability to move freely through lakes, rivers and bays, but by no means should they forget about those who are less mobile. When running to a fishing spot, don’t pass close to waders or pier fishermen and ruin their fishing just to save a little time. Also, don’t crowd waders or kayakers or bank, jetty or pier fishermen. Remember, your ability to find other locations far exceeds theirs, and there’s plenty of room for everyone. When approaching other anglers or entering areas of shallow water, cut the big engine and drift or use a push pole or trolling motor to move the boat into position. And, when approaching other boats, pay attention to which way they are moving and whether they are using a trolling motor or drifting with the current or wind. Besides moving in too close to other fishermen, the worst breach of etiquette would be to position your boat in their path (downwind, in the case of a drifting boat). When fishing in a group of boats, always maintain a respectful distance. If you notice neighboring anglers catching more fish, resist the temptation to move in closer unless they invite you to do so. And when you’re ready to leave, do so quietly, either by idling with the big engine or using a trolling motor or push pole until you are well clear of the other boats. Finally, always stop to assist other boaters in distress. Whether they’re experiencing engine trouble or stuck on a sandbar, always at least inquire about what you can do to help. You never know when the situation may be reversed. Missing out on a little fishing time is a small price to pay to ensure the safety of fellow fishermen.